3 bedroom, 2 bathroom villa in the Lindfields community. Owned by MARTINE SIMMS. Ref: 1359. We have owned our home since 1999. 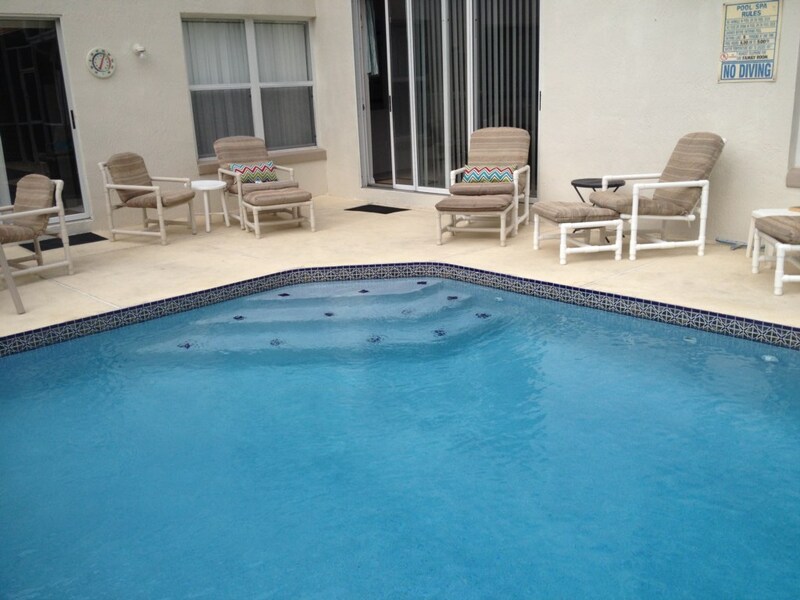 We love to spend time here and have just spent 3.5 weeks upgrading appliances and having the pool resurfaced. We have had great feedback from our guests and the great location. For privacy reasons, the marker on the map shows the Lindfields community location and not actual villa location. 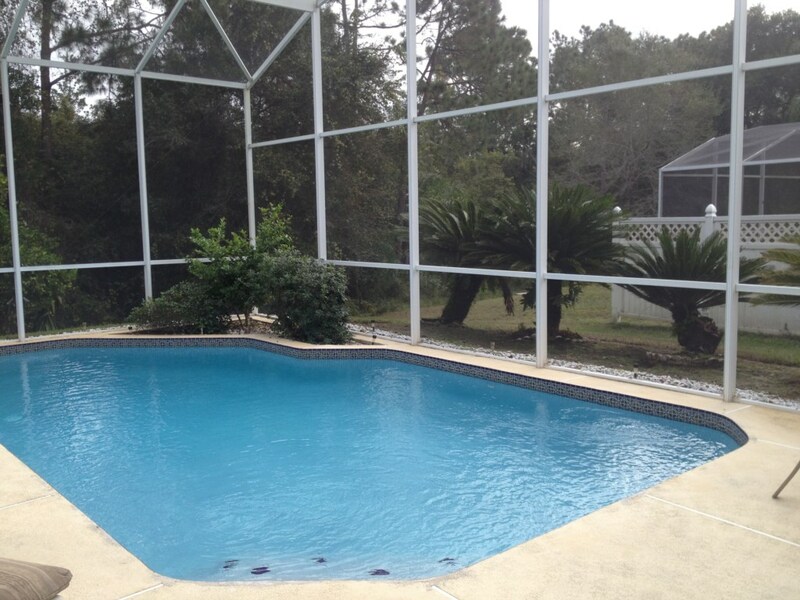 Situated just off Highway 192, within 10 minutes (under 5 miles) to Disney, our luxury 3 bedroom home on Lindfields offers an excellent base for your holiday. The major Orlando attractions are in easy travelling distance along with shopping, restaurants, bars, malls and golf! If you want a break from the parks and wish to travel further afield Interstate 4 is minutes away providing quick access to the beaches near Tampa or Space Coast beaches such as Cocoa and Melbourne. The resort is not gated but our spacious 3 bedroom villa is located in a fairly quiet residential area. 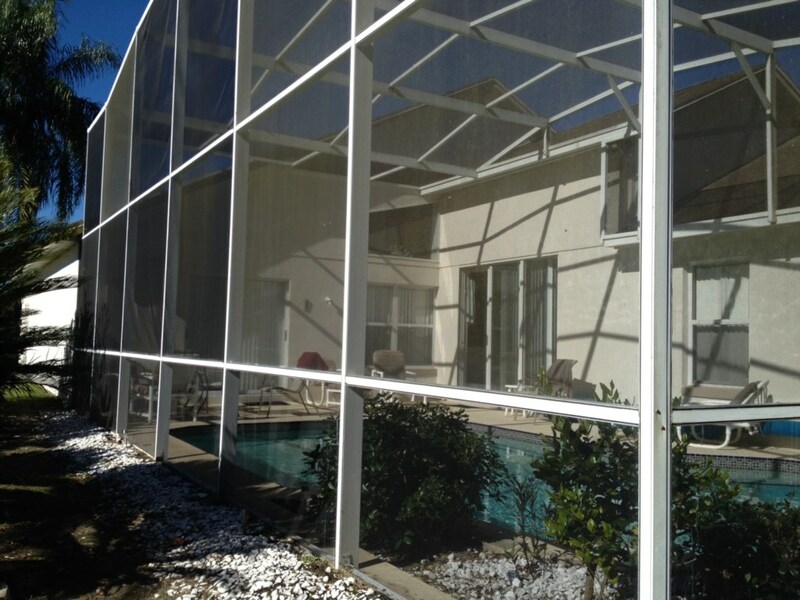 Our pool is fully screened and has a good view over conservation, so no rear neighbours!. The sun is on the pool from morning to approximately 4.00pm depending on the time of year. 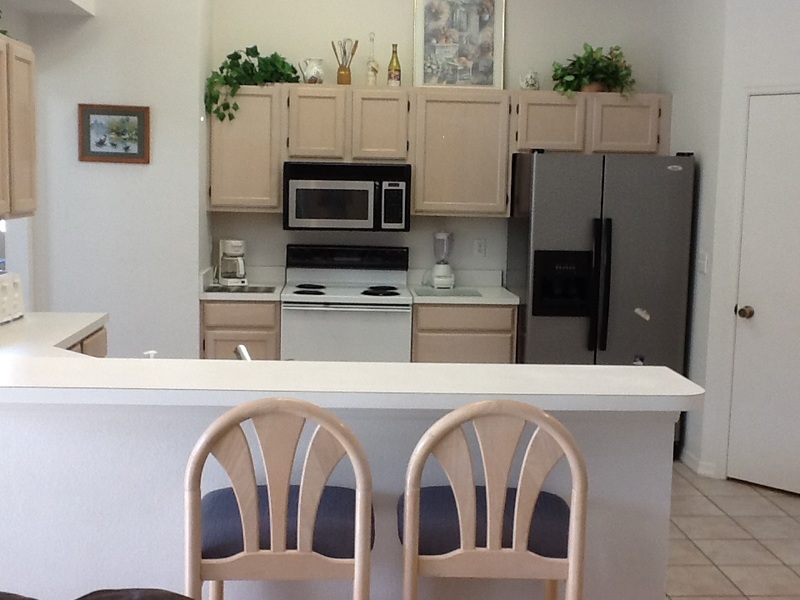 The peaceful location of our home allows a restful evening after a day at the attractions! Relax with a good wine or take a dip in the pool. You can even help yourself to grapefruit, orange or lime from off the tree when in season. 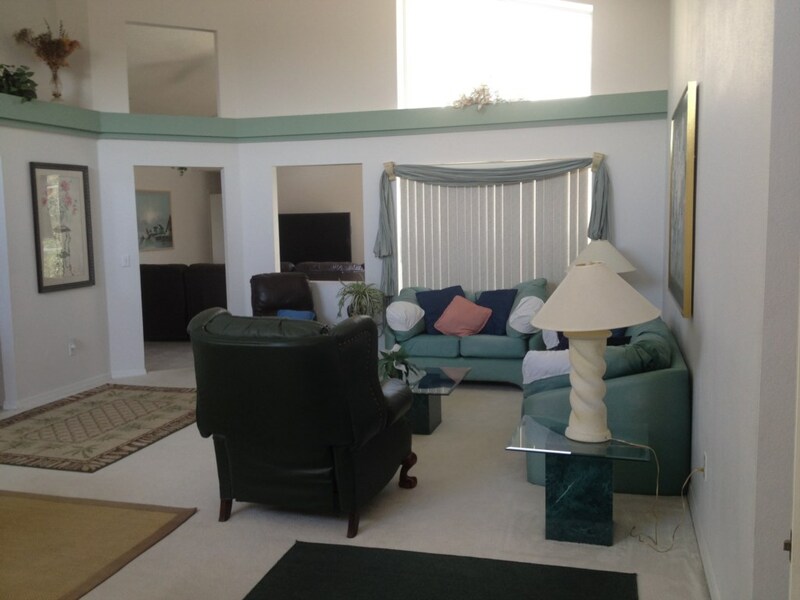 Our super home is on one level and has 3 bedrooms with air conditioning. 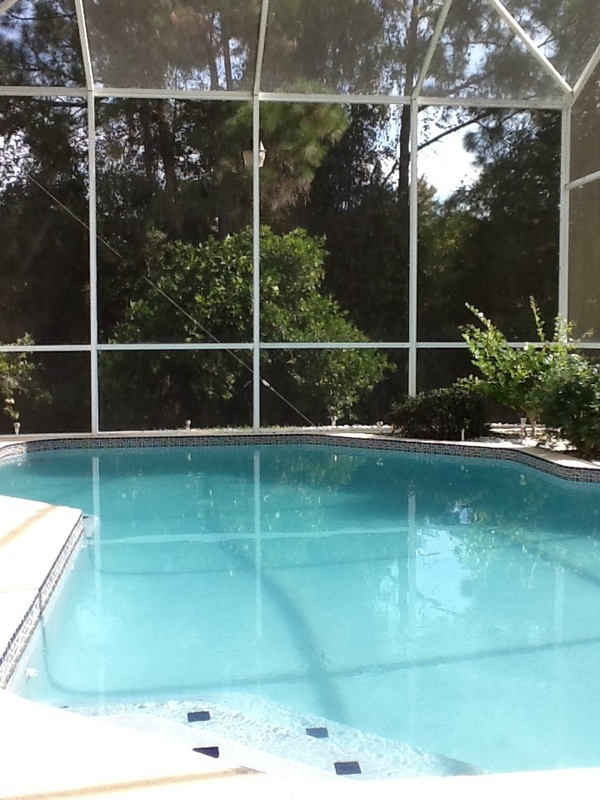 We are in a relaxing setting, backing onto conservation area with a private screened pool, ideal for spending time soaking up the Floridian sun. Foliage surrounds the right side of the pool area giving a large amount of privacy. Yet a short and easy drive to Walt Disney World. Our home interior is on an ample open-plan basis providing home-from-home comforts. There is a fully equipped kitchen, (crockery,cutlery and cookware included) with fridge, freezer, coffee maker, blender, microwave, oven & garbage disposal, a utility room with washing machine, dryer, iron and ironing board, a lounge and two dining areas plus a breakfast bar. 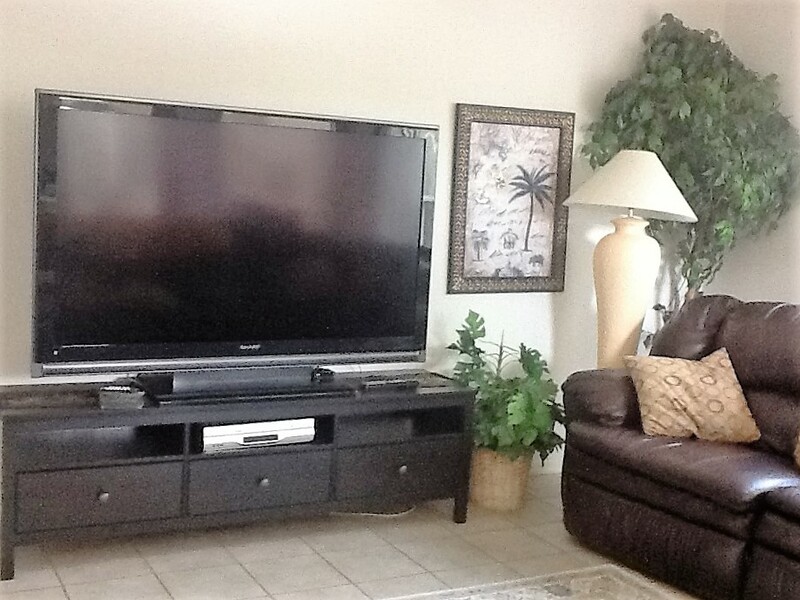 The spacious and comfortable family area has a 65 INCH cable TV, VCR & DVD player,. There is also a ceiling fan in this open plan room area.. There are patio doors out to the pool. There is a selection of CD's , DVD's and books provided. The roomy master bedroom with a ceiling fan has a king sized bed and TV, DVD and has an en-suite with bath, dual sinks and walk-in shower plus a large closet for your clothes. There is a separate toilet. Plus also access to the pool from the master bedroom. 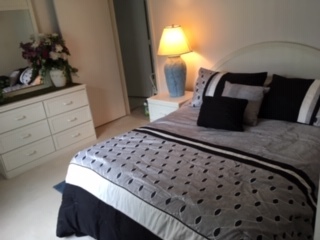 On the opposite side of the house to the master bedroom is a queen sized bedroom and 1 bedroom with twin beds. Plus there is a guest bathroom, which has an over the bath shower. All of the bedrooms have walk in wardrobes. Linen, towels, hairdryers etc are provided. Access to the pool is through sliding patio doors. Both doors are alarmed (manual switch) to assist in your children's safety. We do ask that you do not leave your child unattended by the pool. The pool area is very pleasant with views to conservation. 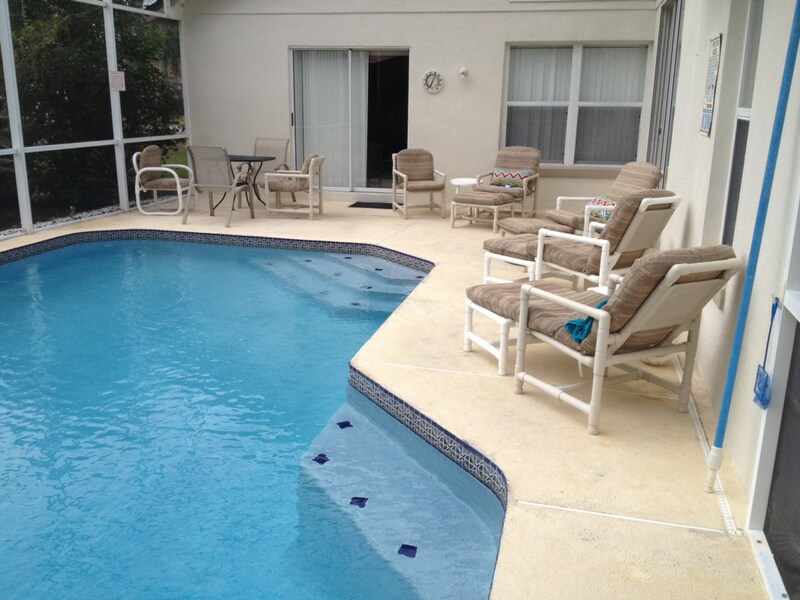 There is pool furniture and a table on the deck to allow you to make the most of the weather. Pool heat is by electric heater and is available for a supplement. You can prepay this or if you are undecided arrange to pay locally to our House Manager. Lindfields is easily accessed from route 192,is less than 10 minutes drive to Disney and other theme parks, with many shops, golf courses and restaurants within a 2 mile radius. Super Target and Walmart are within a 10 minute drive. Private driveway parking as a car is recommended. We hope that you find our home maintained to a high standard. It is well furnished and is well looked after by our local husband and wife team. We have many returning guests so it is recommended to book early for your preferred dates. Allow approximately 1 hour if you are travelling from Orlando International and 1.5 hours if you're travelling from Tampa International. (traffic permitting) The perfect location for a family holiday. Minimum stay 6 nights please request special rate. Discounts available for long stay and late deals. If you are working to a budget let us know and if we have availability we will aim to help! Average rating: 5.0 / 5 from 28 reviews. Great location! Short drive to disney, shops, restaurants and universal not too far! 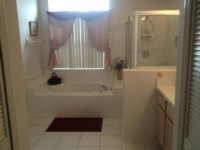 House is wonderful, very spacious, clean and fully equipped! We had an awesome holiday and coming back to the house for a swim and chill made it even better! 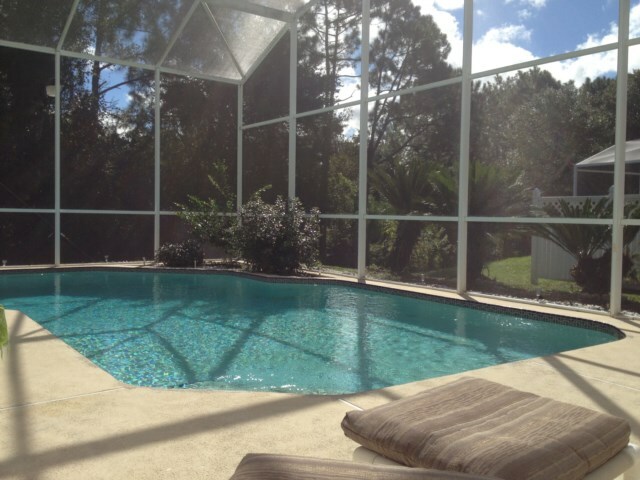 Wouldn’t hesitate to stay again if we return to Florida. Amanda, Dan +2 kids. We recently stayed at the villa. 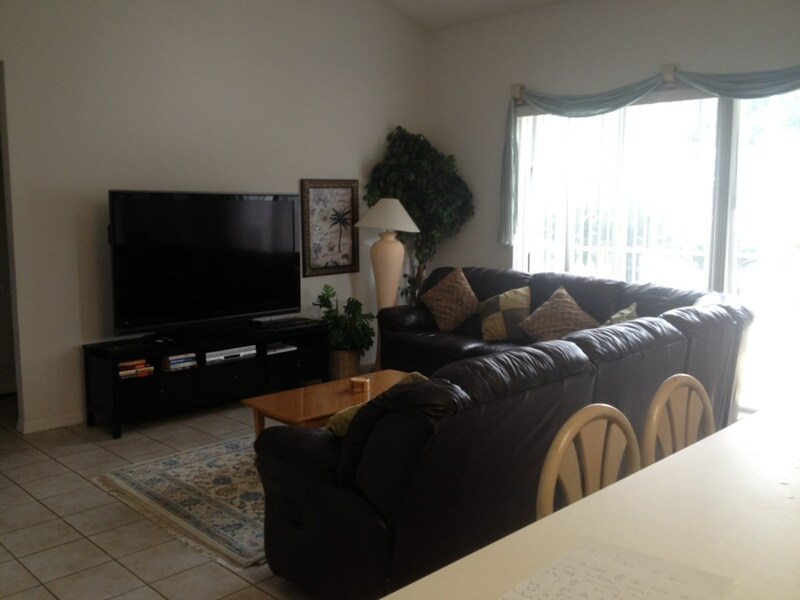 Very spacious and well equipped with everything needed to make it feel like a home from home. The pool was great for cooling off as the weather was extremely hot. We had a very comfortable stay in this well located home. 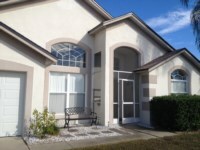 It is very close to the Disney Parks and also many restaurants and shops are within minutes of it's location. 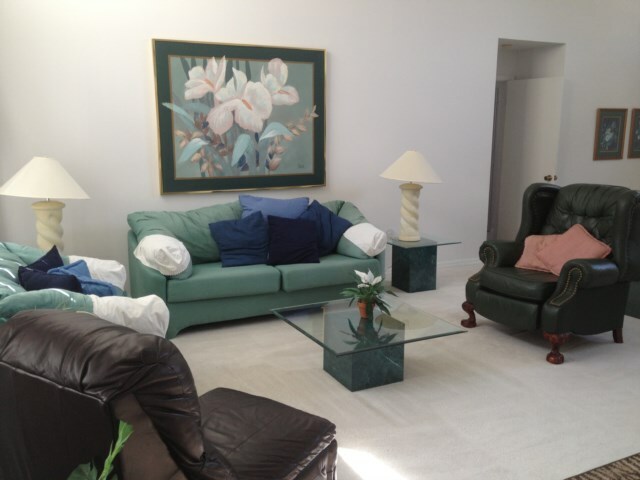 The house, which is in a quiet residential area, is very well equipped. 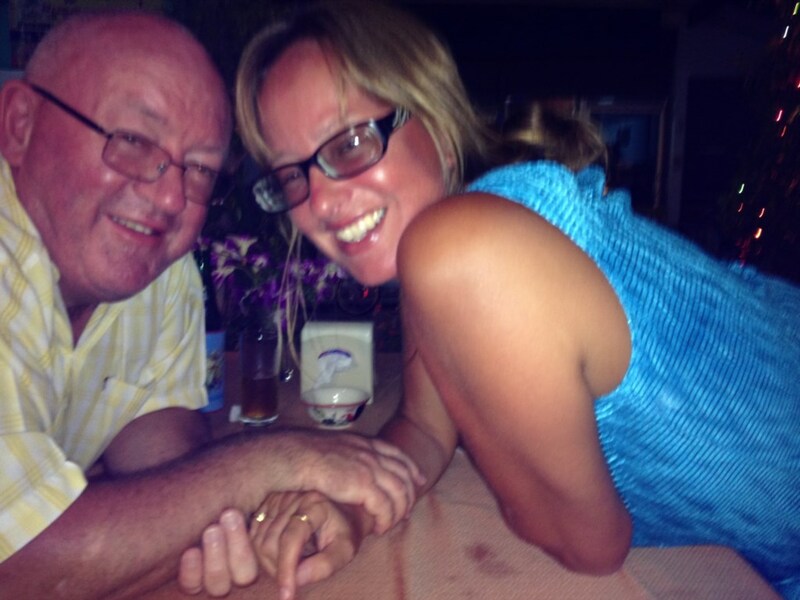 We would not hesitate to recommend to other travellers and would return ourselves. we booked a short 10 day break - just the two of us....villa was close to shops and restaurants, a quiet neighbourhood. Villa was spacious and well equipped. (even had hair straightners! not that I used them) pool was a very good size and just the right temperature. we were very lucky and had perfect weather for our stay, so made good use of pool! I am writing to inform you that we left your house on february 20th. We had no problems and the house has all the comforts we need, so if there is another opportunity to travel to Otlando we will be happy to rent your house again and we will recommended. We had a fantastic holiday and your villa was perfect in every department . To do the parks it was great to come home and chill ,we will be passing on your details to any of our friends and family who want to use yor villa. We stayed here for 10 days for our visit to Disneyland. It is an incredible villa, we wouldn't hesitate to stay here again. We can't wait to go back to Disney again! We had an amazing time thank you, the villa was lovely and my family really enjoyed their holiday - very happy. We hope to be able to visit again one day! The perfect relaxing environment for a busy holiday. The Villa was well laid out, clean with all the facilities you will require. The pool was great and very much enjoyed with relaxing furnishings to settle into after a long days tour of the local parks. All the Disney parks are within 20 mins drive, with the Universal Studios at around 20 mins and there is plenty of local cuisine nearby to experience in the evenings. Cooled to just right to escape the welcoming warmth of the State on those very sunny days, this villa has it all and was worth every penny. Highly recommended for all groups whether a family or good friends. We all loved the house and would definitely consider staying again on our next visit! We only had a week here but it was great, close to everything, nice quiet street and immaculate inside, very spacious and clean, pool was great too. Thanks Martine. 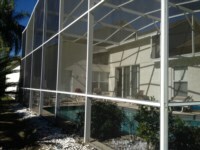 Many Thanks for the use of your home in Florida, it was everything we wished for and more. From the "Wow" when we first walked in, until we sadly drove away at the end of our holiday. It proved a great base for the parks and beyond. Honestly, from the description on the website, your home was just better than we expected. We had a great time at the villa in 2015, having travelled with my wife, 15yr old daughter and her friend. The villa was spacious, clean and modern. The pool was south facing so always warm and inviting. Having visited Florida on vacation many times in the last 10 years, this was one of the best yet. Location was great with quick access to Disney and the I4 road network. Will definitely be back at some point in the future. This villa was perfect for our holiday. There were 5 of us (2 adults, 2 children (21yrs) and a teenager) and we all loved it. The size was perfect, the master bedroom and bathroom meant we had time away from the children, and the pool was lovely. It was near to all the parks and we would definitely use it again if we went back to Florida, would certainly recommend it. Loved the house, it was so ideally situated, not far from the parks and restaurants but quiet and idyllic. Just what you needed to return to after a long day. Has everything you wanted and was clean and tidy. Would definitely return should we come back again. We stayed there for two weeks last years for our Disney trip. 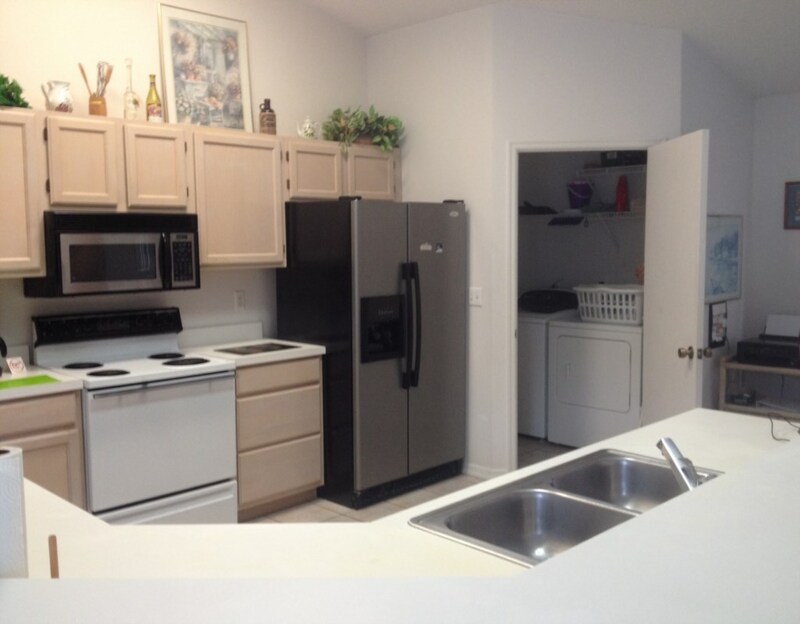 The house is big, clean, well equiped and great for a family. To location is perfect. It's pretty close to Disney and located in a quiet area which is perfect after a day in a crowded park :-) There are many stores and restaurants nearby. I would recommand this house without hesitation. We came for a family holiday and stayed here for 8 nights. 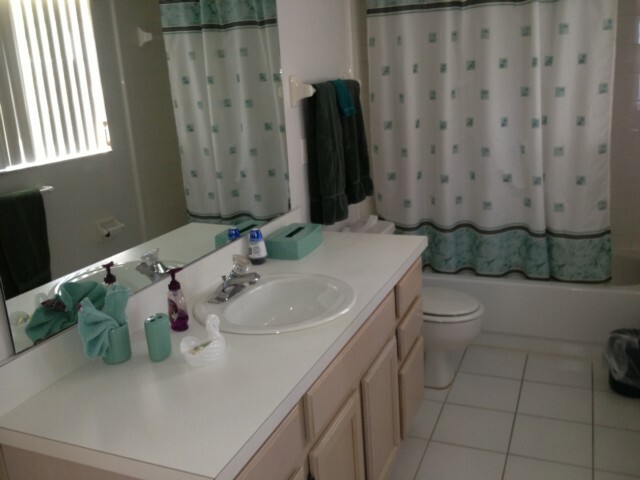 It was in a great location being just outside of the main busy areas but within easy distance of everything we wanted to do (outlet shopping, eating out, universal studios & also close to a Walmart). The villa itself is spacious with a nice open plan kitchen, dining room & living room. Although we didn't go for the pool option it looked great and would consider it next time. I plan on visiting Florida again and would have no reservation in staying here. 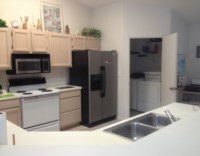 Very clean, great amenities, very good people to deal with. This was a great home in a very nice location. We were able to rent this home for a very resonble price. We were looking for a secluded pool with heat and this home fit the bill. We found it clean upon our arrival and it had the necessities that made vacation more enjoyable. Also it was very close to nice restaurants and Disney. I would recommend this home to others as well. Thank you!! It was very nice trip, because of the nice and private villa. Ein schönes Häuschen in ruhiger Lage mit allem was man braucht. Nach einer kurzen Fahrt in den verschiedenen Freizeitparks. Hat alles gut geklappt! 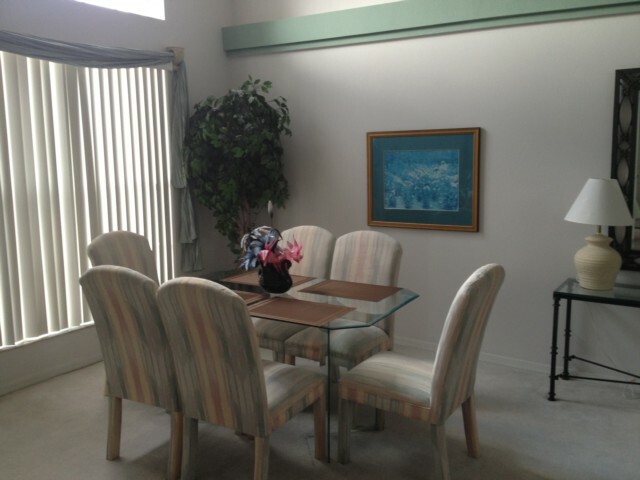 Owner's response: Thank you Janina I'm glad you though our home was "just great" and you had a wonderful stay. The house was just like in the description.Clean and comfortable. Pool was great !! Everything you might need was provided. Close to all the attractions and restaurants. Owner was very easy to work with. We would stay there again. My friends & I had a wonderful stay in this villa. 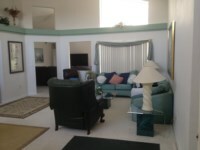 The villa is a great size and hosts a nice open living and dining area with breakfast bar. The poolside is lovely and private, with a decent size pool. This is where we spent most of our time! In terms of location, Lindfields is perfect and just a short drive away from Disney. All in all, we were very happy with our stay - thank you very much. Your enquiry will be sent to villa ref 1359 only. This page has been viewed 77521 times since 29 Apr 2004.